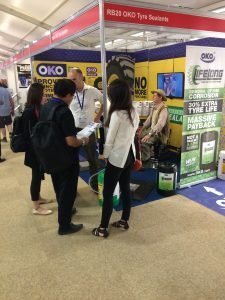 And in June 2018, every single person passed by the (fortunately air conditioned) OKO stand and witnessed our live puncturing demonstration as we put two tyres through hideous damage – and they held their air all through three days of torture, involving many hundreds of punctures, immediately sealed by OKO Off Road anti-puncture sealant. Thanks to the very many off road vehicle-operating visitors who stopped to watch and talk: and we have been following up with them ever since. In addition to showing Off Road heavy duty tyre sealant, and Mining X-tra heavy duty (for 25 inch tyres and larger) we had our exciting new LifeLong product to show – not a sealant, but a free-flowing liquid for those whose main problem is not punctures but the corrosion of wheel rims and the short life of tyres. LifeLong meets those problems head-on. Both steel and alloy rims are protected from rusting or pitting – its nanotechnology lays down a microscopic layer on the metal that can even clean up existing surface rust and works whether the wheel is moving or not. For tyres, LifeLong stops a lot of air loss, while also cooling and conditioning the rubber – the result is an average 30% increase in tyre life! The increased flexibility of the tyre makes mounting and demounting easier. And we have added a UV-sensitive component to the liquid so that under a UV light in the workshop you will see very clearly where bead/rim/o-ring leaks are happening, or sidewall slits – and be able to deal with them. Mining, quarrying and large construction vehicles have big, very expensive tyres and rims – and this new next-generation wheel and tyre life extender offers an amazing payback to operators.